Summer’s bounty has arrived in the forms of paintings, glass, jewellery, ceramics and sculpture… a feast for the eyes! Are you on Facebook, Twitter, Instagram, or Pinterest? Be sure to follow us for updates on new arrivals! Wandering comfortably between worlds of the abstract and narrative, Niina selects and dissects her subject matter to keep the viewer engaged and questioning. 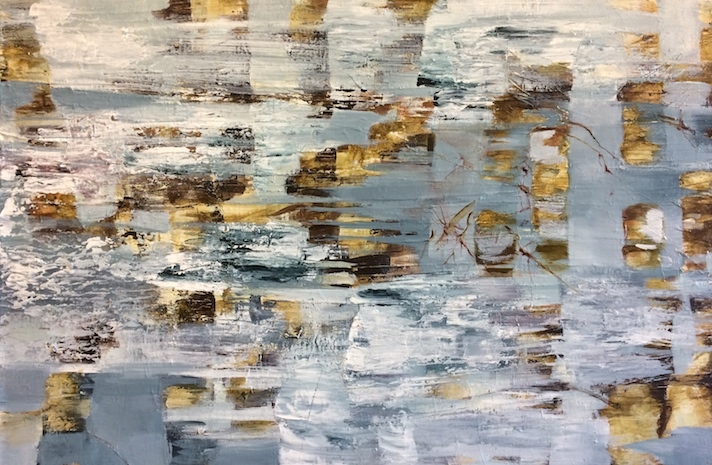 There is not one technique she clings to – but the essence of her approach – the juicy layers of texture and translucent colour, creates a sense of mystery to her work. Her childhood spent under vast prairie skies of rural Alberta, Niina now lives in Vancouver – where the shift to coastal flora and fauna seep into her compositions. A few years ago, my wife Nadine and I were in Florence, Italy. Walking through the beautiful narrow streets we walked past an old stone church and heard gorgeous, young voices coming from inside. They were rehearsing for a concert that night. Of course, we went to the concert. Julia grew up and still lives in a small prairie town nestled in the foothills of southern Alberta. Her aesthetic, based on the simplicity of light and form, is derived from this environment of crisp prairie light, gentle hills and windswept grasslands. Anne’s new Semisphericals Earrings are a perfect example of her unwavering attention to detail and desire to create wearable art. Anne’s Fractal Damascus Scale Earrings meld natural forms, intricate patterns and sublime colours. Thank you for taking the time to read all about new arrivals at The Avenue Gallery! Visit us on our website or Facebook!